Whether you follow a keto or gluten-free diet, Keto in an Instant has spectacular recipes you will want to eat. After a short introduction to the keto diet and the Instant Pot, the book has a multitude of recipes for breakfast, dinners, soups, stews, sides, salads, snacks, appetizers and desserts. Most of your momma’s comfort foods are here. Meatloaf, chili, carrot cake, and beef stew are just a few examples. Your favorite snacks like buffalo wings, poppers, and artichoke dip are also included. My personal favorite is the Cheesy Garlic Cauliflower Flatbread that looks exactly like real bread but has only 135 calories and 2 net carbs per serving. The author suggests using the flatbread for pizza crust too. Due to the low carb count in these recipes, none have more than 500 calories per serving with most less than 300. Most of the recipes take less than an hour to make and much of that time is when the Instant Pot is cooking by itself. There are full calorie, protein, net carb and fat counts for each recipe. For those people also avoiding dairy or soy, there are easy options to substitute ingredients. Best of all every recipe has a full-color picture to drool over. 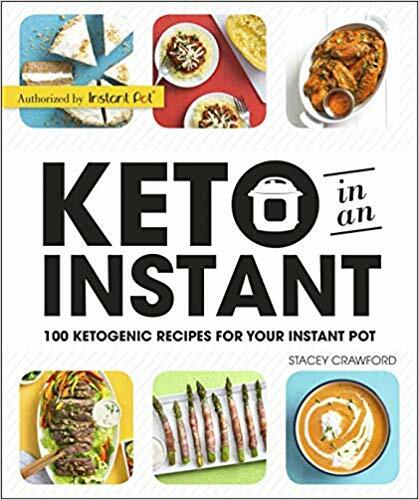 Keto in an Instant is great for Instant Pot owners who are also keto, gluten-free or just want to eat healthier while losing some weight. 5 stars! Thanks to the publisher, Alpha, and NetGalley for an advance copy in exchange for an honest review.